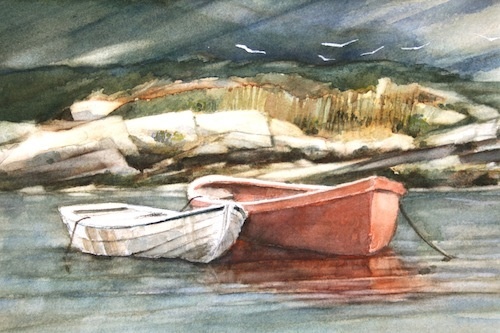 Vyvyan Green Watercolours - Boats in Peggys Cove, Nova Scotia. Boats in Peggys Cove, Nova Scotia. I must admit, I did play around with this place a little, took some of that infamous 'artistic licence'. I am after all an artist, and not a photographer. I used the scene as a starting point to create a painting. It's absolutely amazing to me how many people there are in this world who are familiar with these two boats. Within minutes of me putting this painting up at a show, someone will point and say.... "Ooh! Look Sweetie! There's them two boats like what we saw when we was at Peggys Cove, d'you remember Sweetie.......eh?"